As the case of the Tlanixco 6 enters a critical phase, Front Line Defenders reiterates its call for the immediate and unconditional release of Dominga González Martínez and her 5 co-defendants: Rómulo Arias Mireles,Teófilo Pérez González, Pedro Sánchez Berriozabal, Lorenzo Sánchez Berriozabal and Marco Antonio Pérez González. 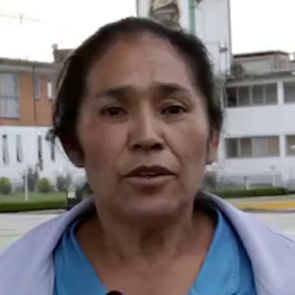 Front Line Defenders maintains that Dominga González Martínez and her co-defendants are human rights defenders (HRDs) innocent of the charge of murdering Alejandro Issak Basso which allegedly took place during a dispute over access to water. This week, the Superior Court of Justice of the State of Mexico will reconvene in the appeal hearing of the Tlanixco 6 and its ruling can have far reaching consequences – either in permitting a gross injustice to persist or to correct the devastating process that has left 6 human rights defenders imprisoned for over 15 years so far. The trial against the water protectors is widely regarded as a miscarriage of justice, with growing recognition that there was no credible evidence to sustain murder charges. From the beginning, the investigation was riddled with inconsistencies, marred by a reliance on the evidence of “witnesses” who were not present at the time of the incident, and the acceptance of evidence that was both contradictory and implausible. One prosecution witness later admitted that the prosecution witnesses were coached by the sister of Alejandro Issak Basso about who to accuse. A teacher named as having taken part in the attack was in another village giving classes at the time of the incident, while another accused person had been dead for over a year. On January 17, in the most recent hearing of their appeal, the local court decided that the case would be referred back for review. While the court would have the option to rule that the original prosecution was without merit and order the release of the 6 human rights defenders, there is concern that the court might alternatively order a complete review of the case from the beginning, which would involve an extended legal process and the continued detention of the HRDs. Both national and international organisations have called for the release of the Tlanixco 6. On 28 November 2018, the United Nations Office of the High Commission for Human Rights issued a statement calling for the release of the Tlanixco 6 on the basis that the verdict was not tenable, given the many abuses of due process in the trial. On Friday, 24 January, the Congress of the State of Mexico passed a resolution calling on the State Attorney General's Office to “withdraw the criminal action against six indigenous people of the community of San Pedro Tlanixco, municipality of Tenango del Valle, who have been in prison for almost 15 years for homicide”. Front Line Defenders urges the government of Mexico, particularly to Governor of the State of Mexico Alfredo del Mazo Maza; Attorney General of the State of Mexico, Alejandro Jaime Gómez Sánchez; President of the Superior Court of Justice of the State of Mexico, Sergio Javier Medina Peñaloza; and Secretary of Justice and Human Rights of the State of Mexico, Rodrigo Espeleta Aladro to recognise that the trial and imprisonment of the Tlanixco 6 was an egregious miscarriage of justice and that they should be released immediately and unconditionally. For the above, Front Line Defenders exhorts the competent authorities to withdraw the criminal charges against the Tlanixco 6, and to immediately and unconditionally release them.